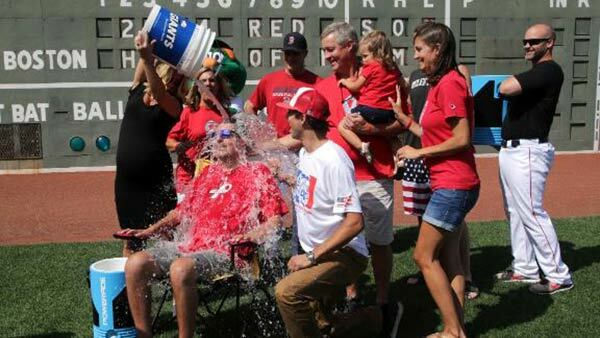 BOSTON -- The Massachusetts man who inspired people around the world to dump buckets of ice water over their heads to raise millions of dollars for Lou Gehrig's disease research is back in the hospital. A Facebook post from the family of 32-year-old Pete Frates asked for prayers Sunday and said he is at Massachusetts General Hospital "and battling this beast ALS like a Superhero." Frates was diagnosed with amyotrophic lateral sclerosis in 2012. The disease weakens muscles and impairs physical functioning. There is no known cure. The family's Facebook post has drawn hundreds of comments of support. Family members said, "We feel your love and support and are so grateful."